Three individually unique rooms. Nestled atop the winding oak stairs are the three bedrooms. 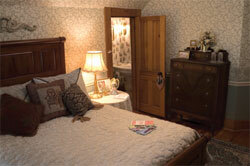 Each room reflects the charm and elegance of yesteryears with a mixture of antiques, collectibles, and period furniture. Our beds have pillow top mattresses & freshly ironed sheets. All rooms have private baths. A bit of heaven awaits you in Grace's Room which features angels throughout. The simple elegance of soft sage and ivory adorn the walls and bed coverings. The queen-size, high-back cherry bed serves as the perfect place to unwind and rekindle the spirit. Like a breath of fresh air, Grandmére's Room features a white, queen size iron bed and wicker chair accent with cool blue and sunny yellow pillows and furnishings. 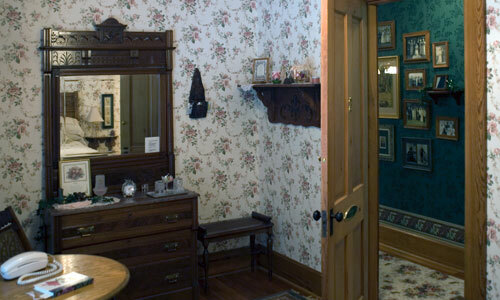 A rose lover's retreat, Madelyn's Room boasts of roses, original yellow pine floors, an antique high-back bed and 1800's sewing rocker. 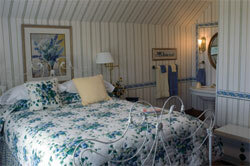 Each room is equipped with cable television and is air conditioned. VCR available. We can do business meetings for up to 10-12 people.